On March 8 2018, Mr. Arkhom Termpittayapaisith, Minister of Transport presided over the opening of the seminar on “Enhancing Safety and Efficiency in Freight Transport”. 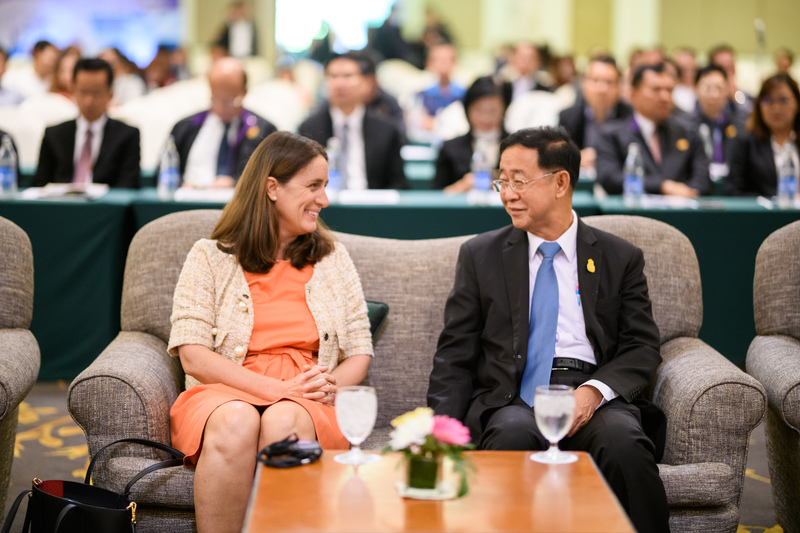 Mrs. Luisa Ragher, Chargé d’Affaires, the European Union (EU) Delegation to Thailand and Mr. Tim Mahler, GIZ country director for Thailand and Malaysia, and high-ranking executives of the Ministry of Transport also attended this seminar in the Grand Ballroom at the Rama Garden Hotel Bangkok. Mr. Arkhom has set a policy to raise the safety standards for freight transport by trucks in Thailand and to sustainably reduce the risk of road accidents. Mr. Sanith Phromwong, the director-general of the Department of Land Transport, executives of the Department of Land Transport, freight transport and logistics operators with trucks as well as government agencies and private sector organisations also participated in the seminar.